How have the Internet and other digital media changed the audience for news? And how has journalism changed its view of the audience, if at all? Those were two of the key questions on day two of the Phil Meyer symposium at UNC-Chapel Hill. So what do we need to think about? Here are a couple of ideas. Think about how the audience interacts with and shares information from the news media. 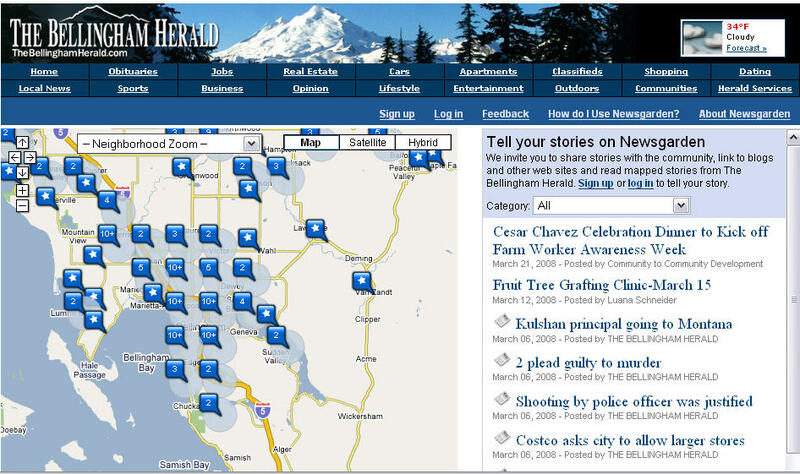 Mark Briggs of the News Tribune in Tacoma, Wash., is involved in a new online project that places local news stories on a map and invites community members to add other items. The “news garden” has been planted at The Bellingham Herald. Think about how TV and newspapers have long rank-ordered news for the audience, by deciding what to lead with or what to put on the front page. Does that matter as much online? Not really, Briggs said. Less than 30 percent of the paper’s online users come through the home page, so what journalists decide to put front and center on the online “front page” may not be that important. What matters more, Briggs suggested, is how people get to those inside pages, via links sent to them by email, text messaging or social network sites like Facebook. Journalists need to recognize the power of the audience as distributors of the information news organizations provide. As a 25-year-old told the New York Times this week, “I’d rather read an email from a friend with an attached story than search through a newspaper to find a story.” Does that mean news organizations should spend less time pushing the use of their primary product–like promos to “Tune in at 6”–and more time making it easy for users to pass along the stories journalists generate?